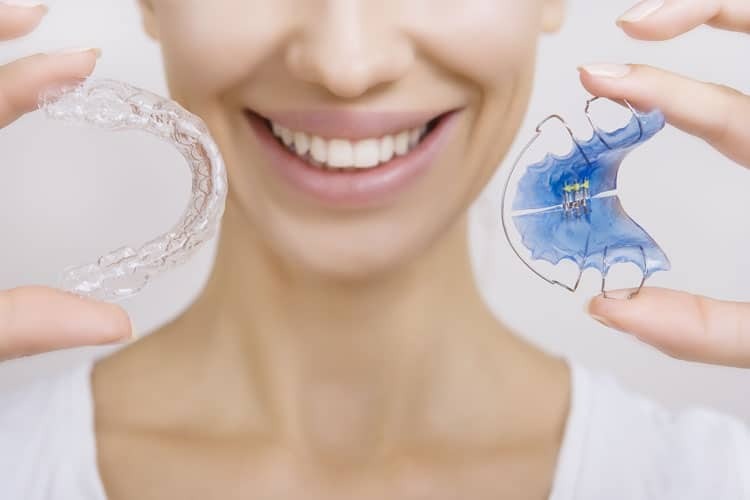 Orthodontics is a specialty of dentistry that is concerned with the study and treatment of malocclusions or improper bites, crooked or crowded teeth and jaws and misaligned upper and lower jaws. The Specialist Orthodontists taught me before I graduated in 1984 from Melbourne University that the cause of over 75% of our children having crowded teeth and crooked smiles was due to dad’s big teeth growing into mum’s little jaws. However, after I graduated I thought – “if this is true why have I not seen children with Dad’s big fingers and Mum’s small hands? Sadly, I still hear that many years after the genetic theory of crowded teeth has been disproved that many Specialist Orthodontists are still blaming bad genetics for causing crowded mouths and treating according by doing extractions. We now know from the latest research that crowding is due to under growth of the jaws and this is due to poor or abnormal breathing and swallowing patterns, displacing the tongue from “living” in the roof of the mouth and preventing the correct growth of the jaws. Normally the tongue lives in the roof of the mouth and every time we swallow, some 2000 times per day, the tongue pushes on the upper jaw causing growth forwards and out left and right growth to accommodate a normally sized tongue. Normal breathing is through our noses all day and night. Abnormal or pathological (ie diseased) breathing is through the mouth. Mouth breathing has been proven to have many ill-effects on our health and well-being from Asthma, allergies, ear pain and infection, to under growth of the jaws and crowded poorly formed jaws and faces. We now know that straightening the teeth by removing 2, 4 6, or 8 permanent teeth, as commonly still practiced by our Specialist Orthodontists, in the vast majority of orthodontic cases is not the correct treatment (presently Specialist Orthodontists are extracting permanent teeth in some 78% of their cases). The correct treatment is to treat the cause – incorrect breathing and swallowing patterns and reverse the under growth of the jaws to normalise their size, shape and 3 dimensional position in the face. To do this we need to do Orthopaedics rather than Orthodontics. Orthodontics comes from the Greek words ‘ortho’ meaning straight and ‘dontic’ meaning tooth. Straight Teeth! Dentofacial Orthopaedics is the branch of medicine concerned with treating problems involving the musculoskeletal system. The musculoskeletal system includes bones, joints, ligaments, tendons, muscles and nerves. The Greek word ‘ortho’ means straight and ‘paedics‘ comes from the Greek ‘pais’ meaning children. To correct the under growth of the jaws of our growing children we need to look at a lot more than just the teeth AND we need to treat them while they are still growing. A child completes 50% of their facial growth by the age of 5 and 90% of their upper jaw growth by the age of 9! Thus I want to be monitoring your child’s growth from a very young age,. At Lifetime Dental our dentists are monitoring growth from birth. We are teaching mum the importance of breast feeding, and nasal breathing and correct swallowing. With regular “Growth Guidance” visits from as early at 6 months old we can see if your child’s growth is on track or off and get them back on track as soon as possible, not wait till they are fully grown. The Orthodontists wait till all the permanent teeth have grown into the mouth and facial growth has all but finished. They then choose which permanent teeth to extract to relieve the crowding and then space the teeth out in these under grown jaws. Then they place their metal or clear brackets to straighten just the teeth. At Lifetime Dental Health Group, our dentists look at all the facial structures that will be effected by under growth of the face and correct all of them as well as the teeth, when they first see it going off track. Waiting for all the permanent teeth is way too late – aberrant growth has been going for too long. For us, if one leg was under grown compared to the other – when would you want to treat the under gown leg? If you are a Lifetime Dental Dentist – as soon as you can diagnosis it. If you are a Specialist Orthodontists – wait till they are 13 and all their growth has finished! This is too late for me and every thing is completely out of control! At Lifetime Dental we practice “dentofacial orthopedics” not Orthodontics. Orthodontic treatment can be carried out for purely aesthetic reasons- improving the general appearance of patients’ teeth and face for cosmetic reasons. Orthopaedics deals with whole body health and improving function of the teeth, bite, jaws, jaw joints and airways are well creating a beautiful smile. For me it is the whole box and dice! My major concern with tooth extraction is that the jaws will end up permanently under grown and the tongue will have insufficient space to “live” in the mouth and so this promotes the tongue to live in the throat and cause breathing and airway issues such as snoring and sleep apnoea. If we are short of breath we will breath through the largest hole to SURVIVE and this is our mouth. This mouth breathing as we have said above is disease and causes a lot of chronic health issues. Misaligned teeth can lead to problems such as increased risk of tooth decay and gum disease, excessive wear and tear on poorly positioned teeth, as well as damage to the jaw joint and associated structures. They can also affect your self-confidence: a mouthful of crowded, overlapping teeth does not make for an attractive smile! Teeth with good alignment are much easier to floss and brush and look great and help build confidence. A lot of our children “come out of their shell” and improved their grades at school after our Orthodontic work. Corrective devices such as braces and plates are used to gently and gradually bring the teeth and jaws into proper alignment. We believe in natural growth guidance. At Lifetime Dental Health Group we can also offer Invisalign for most cases. There is a wide range of Orthodontic and Orthopaedic appliances that are available and can be used including bioblocs, herbst, lingual braces, Myobrace, Controlled Arch and Damon system to name a few. Dr Chris Darby will advise which appliances can be used, the pros, cons and risks during your Orthodontic consultation. Dr Chris Darby will also look at diet, sleeping and breathing habits and also use Kinesiology, as we do practice and believe in holistic dentistry. Dr Chris Darby is an associate dentist member of Sacro Occipital Technique Organisation (SOTO) Australia, one of only 2 in Australia. DR Darby has never had to remove any healthy permanent teeth in any of his Orthodontic cases. However occasionally some baby teeth may need to be removed before work begins. Philosophically we believe that we were not born with any spare parts and so far Dr Chris Darby has never done any extractions for any of his orthodontic cases. There may also be a need for fillings, and a professional clean and X-rays for checking for decay. As Lifetime Dental Dentists are general dentists, they can do all this as well as the orthodontic treatment for your children. No two orthodontic problems are the same and the cost of orthodontic treatment will depend on the severity of the problem. Dr Chris Darby is a general dentist who has done further education and training in Orthodontics. He is a member of International Association of Facial Growth Guidance (Orthotropics®) and International Association for Orthodontics. For the first few days after your removable orthodontic appliance or fixed braces are place you are likely to experience some tenderness of your teeth and mouth which can be easily overcome by taking your every day pain killers. While your teeth are tender we recommend you eat soft foods. This tenderness should generally last no longer than a week. Sore spots can develop from the braces and wires rubbing the inside of your cheek. This can be prevented by coating your braces and wires with the wax provided. If sore spots do develop rinse your mouth with warm salt water, or use ulcer creams i.e. Bongela. Lifetime Dental also provides the Invisalign® option for Orthodontic Treatment. Ask the dentist about it at your next appointment! Invisalign is a set of clear plastic aligners that move the teeth in steps to a permanent new position. Patients like invisalign because they are invisible braces that cannot generally be seen while wearing. Also you can remove them to eat and clean which is a lot easier than fixed braces. As your teeth straighten the arch wire may begin to poke out of the very back brackets and bands, causing it to rub on your cheeks and cause sore spots. Sore spots can be prevented by placing wax over the poking wire. However, if the arch wire becomes too long you will need to make an emergency appointment with us to have your wire trimmed. Playing with the appliance – this is the most common cause of a broken appliance. If a breakage occurs we require you to contact the practice as soon as possible. Please do not leave it until your next appointment to tell us if something is broken or bothering you. We will arrange an appointment to fix this problem as soon as our schedule allows. Please note that the appointments to fix breakages are usually scheduled during school hours. We do not charge for the first 3 emergency orthodontic appointments. But more than this we unfortunately charge for. Go to the Smile Gallery to see before and after photos of one of Dr Darby’s orthodontic cases.